Another odd year with ups and downs. I'll use the usual categories to break it all down. Prints- Another year where events conspired to keep me from getting a lot of work done. I did pull new copies of some old blocks, but in the end I only completed three new prints- a train image for a specific show, a new saint for my nephew, and the most recent Christmas card. Shows- I missed out on would have been my first show of the year when a few days below zero killed my car battery and I couldn't deliver the work. However, I did still show 11 pieces in 6 different shows this year, not including the small works I had in the WUF/craft fair in Belmar. 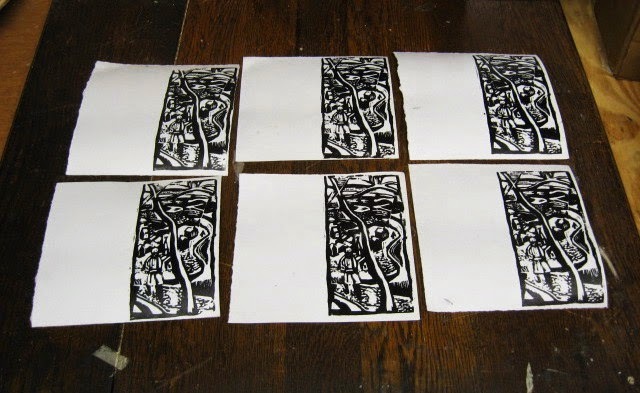 Publicity- One small bit that I ran across by accident, a nice little write up of my Belmar woodcut course that ran in the TriCty News, a weekly paper published in Asbury Park. Awards- For the fourth time I received a juror's award at the annual Juried Art show at the Belmar Arts Council, this time winning the Graphic Arts category. However, just a ribbon and a check, as they have discontinued the annual show for all the winners. Firsts- A few new things through my involvement with the Belmar Arts Council. I have contributed to the painting of traditional murals in the past, but this year I was part of a more modern system where the painting was put on cloth, and then we adhered the sections to a prepared wall- Belmar's train station. That mural was related to a train themed show that I was asked to run. I've handled shows before, but this time I was also asked to create the poster/postcard image that would be used to promote it. The print show in Newark was my first time in that gallery. 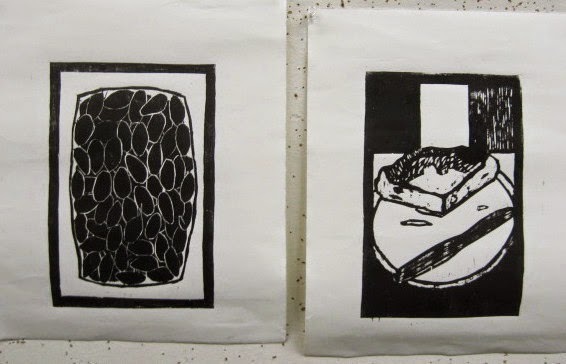 Misc- This year the BAC had a first ever show devoted to work from current students, and I got a nice representation from my woodcut students. The sudden demise of Daniel Smith put me in a position where I need to find new materials and/or suppliers for my work. The Studio- A rough year for our space. It survived two hurricanes in recent years with no damage, but the exceptionally cold winter froze city pipes and let to a minor flood, which damaged nothing of mine, but forced Molly to get rid of a lot of art, and put the whole place into disarray for weeks. I'm hoping for an off season without any natural disasters, which would be the first time in years if we pull it off. Last night I finished coloring all the copies of the new card that I had at home. This morning I folded and trimmed them. You may have noticed that half these cards have figures wearing mostly red, half mostly black. These represent the first two batches printed, with me doing more cutting between them, eliminating most of the black from the figure. Besides these 6, I had distributed 3 already, and the other 3 copies weren't good enough to be part of the run. Of the above prints, two were written out this morning and already mailed to friends out of state. I'll try to write a bunch more tomorrow so that they can go out on Friday. 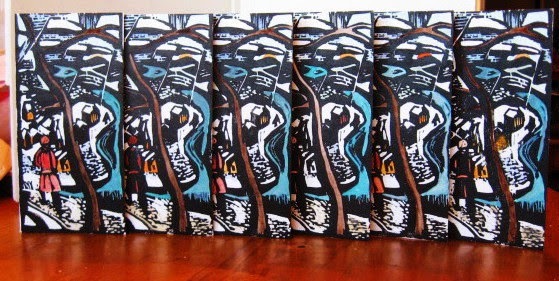 There are 6 more drying up at the Studio, and I'll color them next week. I had mentioned a few days ago I'd tell the story behind this one. I've been doing cards based on fine art pieces for more than two decades, and I usually do a straight copy of a color piece, with slight modifications to give it a winter/seasonal or Christmas theme. Often the piece relates to something from the past year, such as a something seen in a recent museum show. Unfortunately I haven't been to a museum lately. Sometimes I'll just go through books on the shelves, looking or inspiration, but ideas weren't coming easy this year. Eventually I figured out something I could do. Back in Carbondale, Professor Michael Onken had exposed me to the work of Lynd Ward, the 20th century wood engraver. Ward had run across Masereel's woodcut novels and was inspired to do a few of his own, in addition to illustrating other books. One of the best known of these is his take on Frankenstein, a copy of which I found in the store that sold comics on the Strip in Carbondale. I regularly have it with me whenever I'm teaching woodcut- workshops, college classes, etc. Not because I expect those students to copy anything; the woodcut tools just can't match the fine lines of the engravings. More just to see excellent examples of black and white. My favorite piece in the book is a full page image of two figures up on a hill overlooking a town, with us looking past them and down into the valley where the town is. Between Belmar and my brief time as a print professor this fall I was showing this book a lot, which maybe finally put this piece in my mind for this project. Only problem was that my process calls for a color artwork. There was an occasion a few years ago when I chose a black and white Masereel print for the card and chose colors of my own to liven it up, so I figured I could do that again. 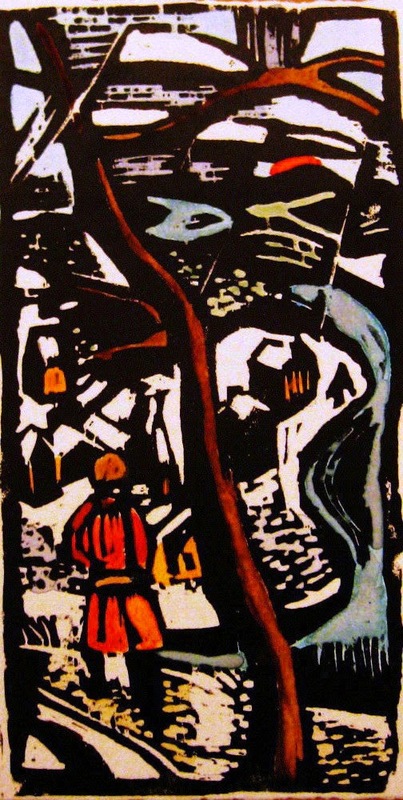 Rather than just make something up, I based them on the palette of a Bruegel painting set in winter. So two artists I admired worked together to make this year's card. It's been several days since I was last here, mostly busy with holiday stuff. The holidays aren't over yet, but I do have a little break in the schedule for the next few days. Anyway, the holidays aren't really over until I get my cards printed, colored, written out, and mailed, so it's going to be the holiday season for at least another week. So if we're going to get there, I better get going on the cards. In the afternoon I drove up to the Studio to get started on another batch of Christmas cards. Years ago I always printed 24, maybe getting a few lesser proofs, and having to decide who would get the remaining ones. These days I get relatively few cards. Maybe everyone is just texting their greetings. I have several cards remaining from the first two batches printed (12 total), and enough usable ones to make cards for all those who have earned one this year. But maybe some will come late, so I figured I should have some spares ready to go. These cards are actually one of the more difficult things I regularly print- the small size doesn't leave much area for the paper to stick to, and the card stock itself doesn't stick will to the inked surface, so there are always a few that shift and smear. At least five of six from today are usable. The other thing I wanted to deal with today was an upcoming show in January. In recent years the Belmar Arts Council has held a Salon show to open each calendar year- an open show, with each artist getting to put one piece in the main gallery, and at the opening, being able to present the work to the assembled crowd and take questions. This year's theme is "You Are What You Eat", and the plan is to have the artists show work and bring the depicted food item to the reception. No time to create a new block right now, but still do have many of the Fourth of July blocks, and a lot of that series included images of food. I came up with two possibilities of things I can make easily that would be practical to bring to an event, and I could pull new proofs of. One was a big tray of olives from the local Italian store in Southern Illinois, which I would likely turn into olive rolls. Another possibility is an Italian style cheesecake from my midwestern St Joseph's Day party, which can be made the day before if necessary and would be fine to sit on a table. Both prints were seen in their original form as part of my showing of the Fourth of July there a few years ago, so maybe this time I'll try coloring them. After the cards I pulled one proof each of these prints, and left everything the Studio to dry for a few days. Once again it's been a very hectic holiday season. I printed the first batch of cards a little over a week ago, and after making a few minor alterations, printed a second batch a few days ago. The first ones weren't bad, if fact the ones I handed out today were from that edition (the new ones are stable enough to color, but would have left the people who received them with very inky hands), but this just makes it look a little more like the original source. I'll put up something about the story of the art that inspired this one in a few days. I'm giving myself the rest of the day off, but I've got grading and other stuff to be dealt with real soon. Getting really close to Christmas, but I am in good shape. Got all my shopping done, and finished printing a dozen cards so far, enough for those I'll be handing out and for mailing to the people who have already sent me one. And today I baked my annual Christmas batch of chocolate chip cookies. This all relates together. I often get praise for these cookies, which I find a little strange because I am just following the recipe on the Nestle bag. 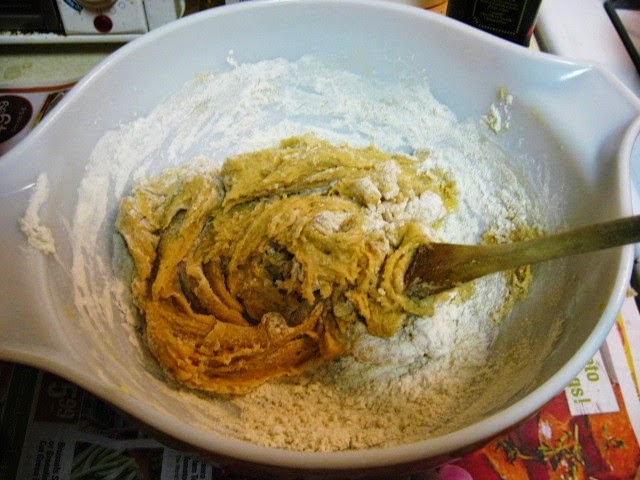 One thing I do differently from most people, I'm guessing, is that I do all my mixing with a wooden spoon, rather than using an electric mixer. Takes a little muscle, but it seems to work well. And these batches of cards I printed over the last week were also done with a wooden spoon instead of a mechanical press. More effort, but more control is available. One simple tool helps to create both cookies and cards. Of course, I'm not using the same spoon to do both tasks. The ones in the Studio are old, dirty with ink, polished smooth from repeated use, and sometimes cracked, which is how they were retired from cookies, meatballs, etc. If you don't have a set, go out and get some today. The past few days I have continued work on my Christmas card project. Working on and off both at the Studio and at home I transferred my adapted design drawing to the woodblock and started cutting. 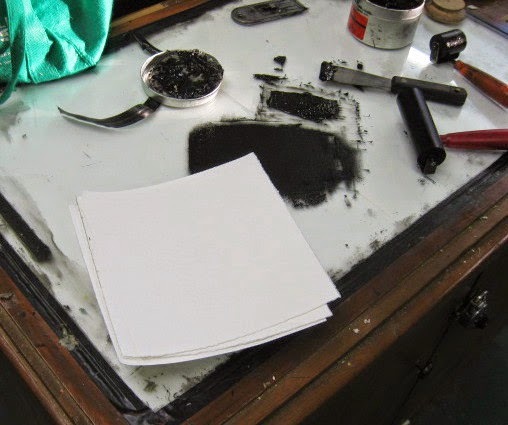 This afternoon I was back up at the Studio to complete the cutting and pull several proofs. Used the Outlaw Black again- not easy to roll it out but it does print very well. I printed 6 of the cards today, which should be enough to get at least one final prototype as I start playing around with color. Usually I am copying the color of the original piece, but like with the last time I used a black and white print for inspiration, I'm going to have to make something up. Christmas day is still a week away, so I'm actually a little ahead of schedule, at least how my schedule has gone in recent years. The results will be here in seven days. I have about a week of school left, one class at each school. That means that Christmas is just around the corner and I've got to get going on my annual Christmas card. In the past the subject was often chosen based on something seen that year, but I haven't been to a museum in ages. Over the past week I spent many hours looking through my art books, seeking inspiration for a new card. Yesterday I finally made a decision, and today I began doing some sketching on paper, thinking about how I'm going to adapt the original work for my card. It is my custom not to reveal this until I post the card here on Christmas day, but I can say that this year's card will be based on something related to my brief run as a printmaking professor this past fall. I plan to do the block drawing tomorrow, and ideally, cut and print a few prototypes by Thursday. That would allow me to get it colored and photographed well ahead of the 25th. The full print run may not happen until January, but such is the life that goes along with college teaching. Officially winter is still a few weeks away, but lately we've had a lot of days that felt like winter. This morning was gray and very cold, but dry at least. Forecasts call for a nor'easter of heavy rain to arrive tomorrow, but my long drive to school was not affected by weather, and all my loading and unloading of stuff for class was fine. Driving home, as I got near the Neptune/Tinton Falls area I noticed what looked like snow on the ground alongside the Parkway. Not deep, but everywhere. Not good. So on the way home I diverted to the Studio to check out conditions there. No sign of snow in our parking lot, and nothing falling at the moment, so I assumed we were still on for tonight's critique. Okay, not so much a secret critique, but the batteries in my camera were dead, and what I thought were spare ones in my bag were also dead, so those of us who were there were the only witnesses to tonight's art. We had five artists bring work, plus one stop by just long enough to pass out invitations to an event. Later my father told me that there was snow falling much of the day. No accumulations, but maybe some potential participants were spooked enough to stay home. I showed the latest supermarket block, which includes changes suggested at the last crit. Molly had some prints on Japanese paper, Mary showed a new block in progress- perhaps the beginning of a new series based on a day in NYC, her daughter Katie had a mixed media print/photo also with origins in that same day in the city, and Lisa had 3 new found object sculptures. You'll just have to take my word for it.